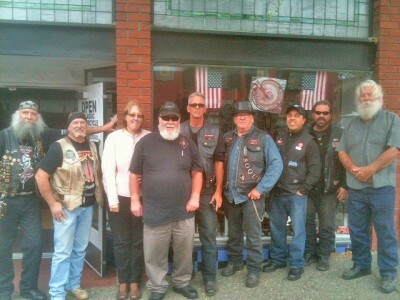 Christian motorcycle club from the San Lorenzo Valley — God’s Warriors — visited the Museum today. 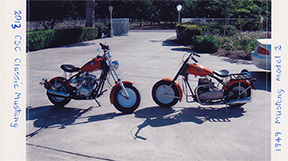 They rode a variety of bikes, but they’re positive that Jesus had a Harley because the Bible says he walked everywhere! 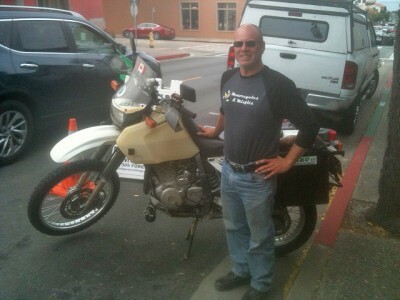 This entry was posted in Motorcycle Museum, Motorcycle Museum: Visitors to the Museum on 3 October 2015 by oldgeezer. Jeff Stoehler is from Winnepeg, Manitoba, Canada. He’s riding his Suzuki DR650 to Ushuaia, Argentina, the End of the World — the tip of Tierra del Fuego. Brave man, Jeff. 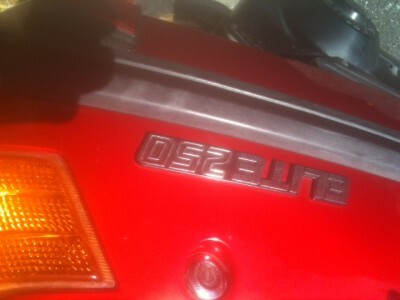 I had to tell him that when I was in Ushuaia, the only motorcycles that had made it that far (that I saw) were BMWs. 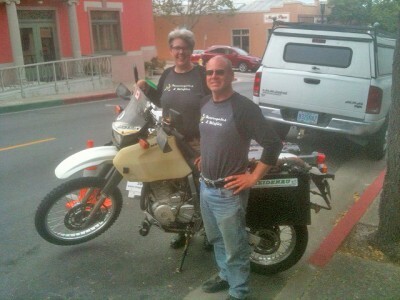 Jeff was with Liza Miller of Re-cycle Garage (Santa Cruz, CA). I’m sure she’d set him up if the bike let him down. We wish him all the best! This entry was posted in Motorcycle Museum, Motorcycle Museum: Visitors to the Museum on 22 August 2015 by oldgeezer. Erick (far left) runs a motorcycle and scooter rental business…in Madagascar. 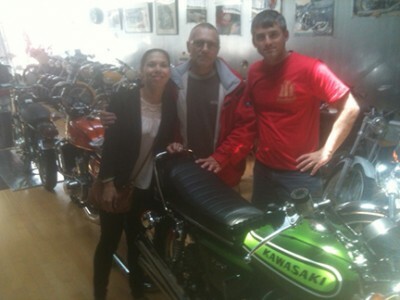 He was here visiting his daughter and son-in-law and they posed with the Norton and the Kawasaki. 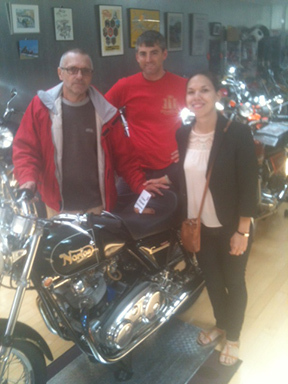 This entry was posted in Motorcycle Museum: Visitors to the Museum on 7 June 2015 by oldgeezer. 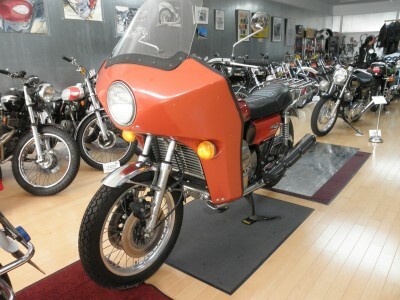 This entry was posted in Motorcycle Museum, Motorcycle Museum: The Latest Updates on 16 May 2015 by oldgeezer. 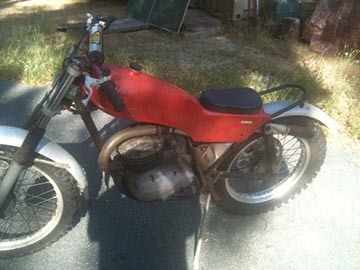 This entry was posted in Motorcycle Museum: The Latest Updates on 13 May 2015 by oldgeezer. 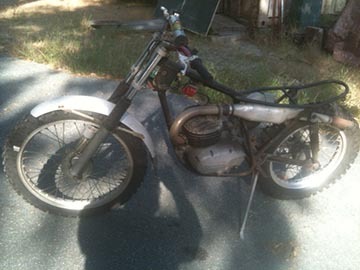 This entry was posted in Motorcycle Museum: The Latest Updates on 9 May 2015 by oldgeezer. 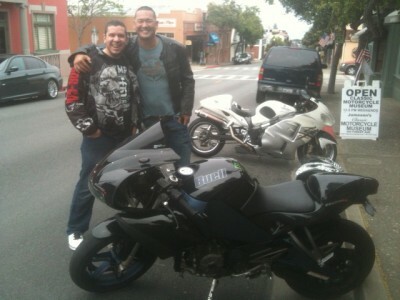 My grandson, Russell Hayes, came by today on his Buell with his friend Winston Yeung in tow (figuratively) on his Hayabusa. They spent a good part of the afternoon here, and are now thinking seriously about a sidecar, having tried on the BMW/Jawa rig for size. They went off in search of seafood for lunch and set the seagulls squawking. 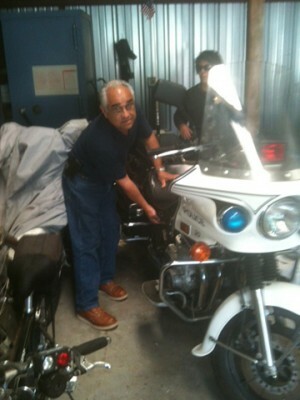 This entry was posted in Motorcycle Museum: Visitors to the Museum on 9 May 2015 by oldgeezer. 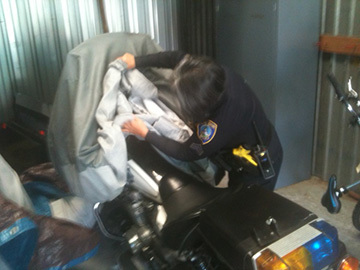 We finally got through the red tape and now have the Pacific Grove Police Department’s retired 1996 Kawasai KZ1000P sitting on a trailer, ready to be dusted and displayed during Good Old Days, April 11-12. 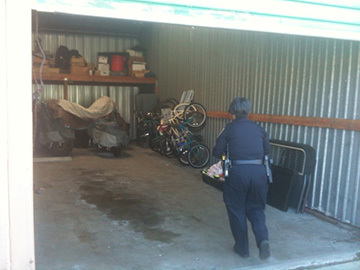 There will be an officer on hand with trading cards and stories, and we’ll have cookies. 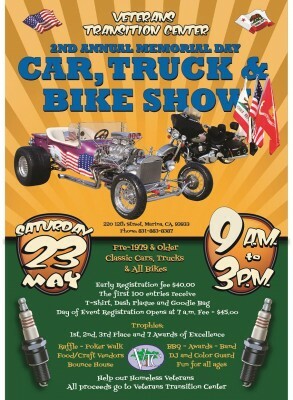 Come by and see it. There will be a reception later in the month. 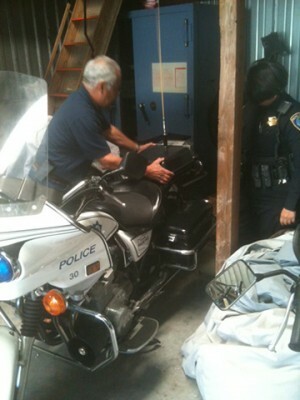 We’ll have the Kawasaki indefinitely. 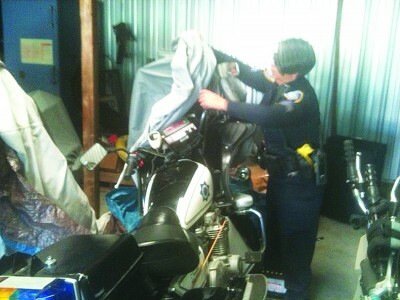 The bike is in excellent shape, having been cared for over the years by Larry Esquivel, a reserve police officer. 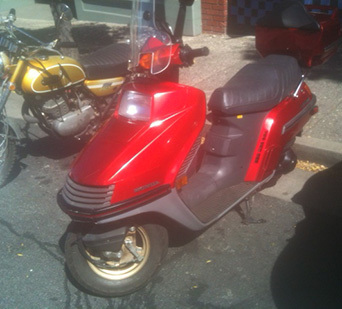 This entry was posted in Motorcycle Museum, Motorcycle Museum: New at the Museum on 10 April 2015 by oldgeezer. 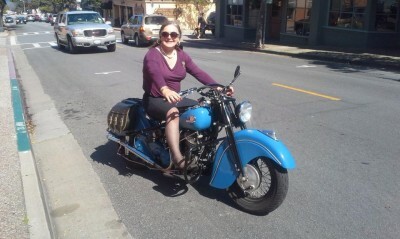 Emma, champion restorer of all motorcycles old and new, replete in pearls, brooch, nylons and heels, rode Brian Stearn’s 1946 Indian Chief around the block. 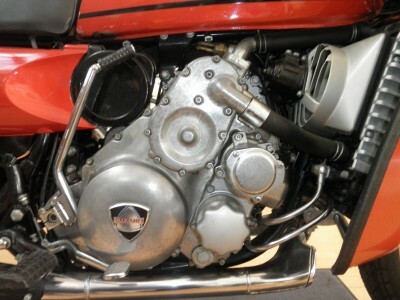 This entry was posted in Motorcycle Museum, Motorcycle Museum: The Latest Updates on 8 March 2015 by oldgeezer. 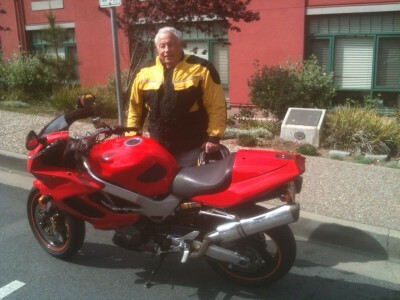 Bob Reich came by today, March 9, with his new Honda 996. Beautiful machine! 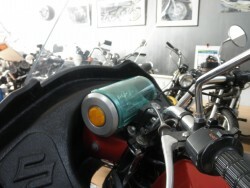 This entry was posted in Motorcycle Museum, Motorcycle Museum: The Latest Updates, Motorcycle Museum: Visitors to the Museum on 8 March 2015 by oldgeezer. 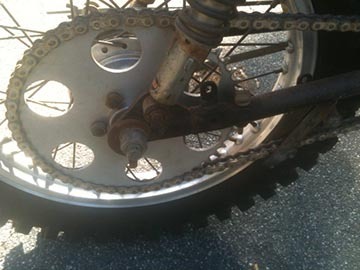 This entry was posted in Motorcycle Museum, Motorcycle Museum: New at the Museum, Motorcycle Museum: The Latest Updates on 25 February 2015 by oldgeezer.